The staff was warm, gracious, and very accommodating, with no stuffiness. Great hotel in a perfect location for sight seeing. Comfy bed and the best hotel shower I’ve ever had! Location was perfect for the things we wanted to do on this trip. Staff was very friendly and helpful and it was clean. My wife loved the heated bathroom floor. Didn’t care for my shuttle service but that had nothing to do with the Hotel. Sunday checked into my original hotel which was so cramped it gave me claustrophobia. Checked into Hampton Inn Monday morning; great front desk staff, normal sized rooms allowed me to enjoy rather than endure my NYC trip. Located in Financial District, this apartment building is steps from New York Stock Exchange and Wall Street. Battery Park and National September 11 Memorial are also within 10 minutes. Broad St. Station and Wall St. Station (Broadway) are within a 2-minute walk. 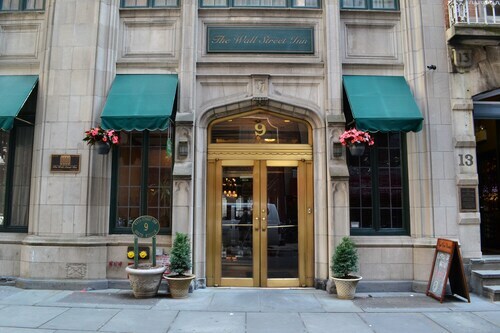 Located in Financial District, this hotel is within a 10-minute walk of Wall Street and New York Stock Exchange. National September 11 Memorial and Battery Park are also within 15 minutes. Wall St. Station is 7 minutes by foot and Fulton St. Station (William St.) is 7 minutes. Right in the heart of Wall Street and close to the water. You'll be hard-pressed to forget visiting Battery Park, one of the most popular attractions around. It is located in New York, a much-loved city that draws people from across the globe. You'll have no problems finding the perfect accommodation in which to hang your hat at the end of an exhilarating day. There are at least 27 candidates just a stone's throw away from Battery Park. 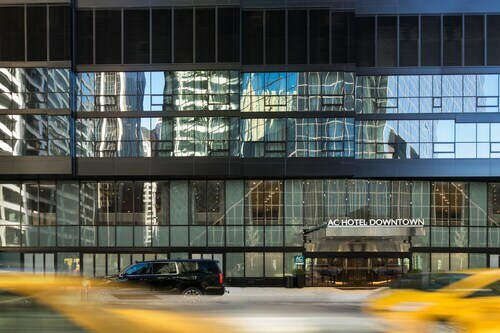 Once you've sorted out your dates and are ready to begin your search, check out The Ritz-Carlton New York, Battery Park, W New York - Downtown and New York Marriott Downtown. A satisfying sleep is that much sweeter when it doesn't break the budget. 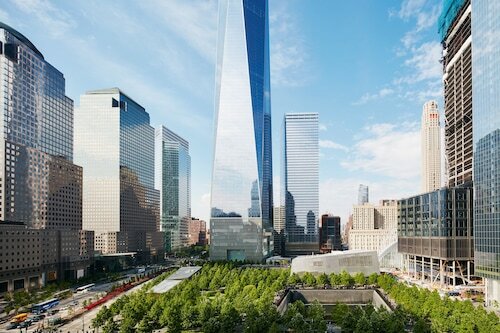 Luckily enough, the Courtyard New York Downtown Manhattan/World Trade Center is only 0.4 miles (0.6 kilometers) away. Make your Facebook friends green-eyed by staying a few nights at one of the upscale hotels that are not far away. 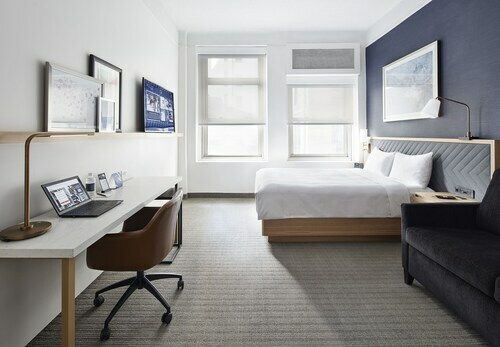 You should make a booking at the Smyth, A Thompson Hotel, only 0.9 miles (1.4 kilometers) away, or the Roxy Hotel Tribeca, 1 mile (2 kilometers) away. If you're the sort of person who does a large amount of your traveling from behind a cafe window, you're in the right place. Within quick stroll, Starbucks will provide all the drinks and treats you could desire. If you plan to eat out for lunch, stay close by and head over to Battery Park, New York, NY. If you still want more, you might want to stop for a beer or wine at Murphy's Tavern. Learn a bit more of the area's history with a tour of the thought-provoking Castle Clinton National Monument. Learn more about the fascinating wonders of the natural world at National Museum of the American Indian. You should make time to admire National Archives at New York City, a historic civic building. History doesn't always come alive in textbooks, but the exhibits at Fraunces Tavern Museum make learning an enriching experience for all. Let the kids burn off a bit of their seemingly limitless energy by playing at Bowling Green Park, a green, leafy getaway within the city. Why not board a train to get to Battery Park? The closest stop, World Trade Center, is only 0.6 miles (1.0 kilometer) away. Need insider tips on must-see attractions in Battery Park? Check out our Battery Park travel guide! How Much is a Hotel Room in Battery Park? 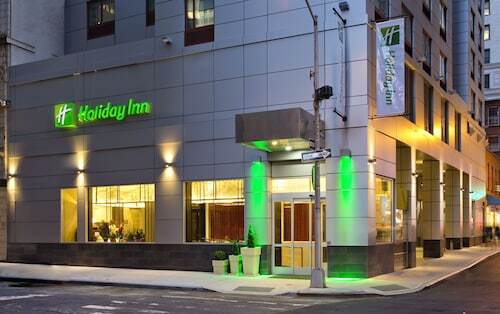 Hotels in Battery Park start at $99 per night. Prices and availability subject to change. Additional terms may apply.